The Remote Electrification Readiness Program will support the development of community readiness plans. These plans will help eligible communities identify opportunities for job-specific training, relevant health programs, business innovation mentoring and economic development supports. Increasing economic development opportunities, including participation in the work to join the grid, new business initiatives made possible by greater access to grid-connected power and the potential to invest in future feed-in tariff projects. Improving social and living conditions for residents. Providing cleaner air and reduced greenhouse gas emissions. Reducing the likelihood of diesel fuel leaks and spills. This initiative will help to fight climate change by reducing greenhouse gas emissions. In addition, connecting up to 21 diesel-reliant First Nations could result in savings of about $1 billion over the next 40 years compared to continuing with diesel generation. This program is an important first step. Ontario needs the federal government's commitment and cooperation to continue our progress. Working with First Nations in Ontario supports the government's economic plan for Ontario. The four part plan is building Ontario up by investing in people's talents and skills, building new public infrastructure like roads and transit, creating a dynamic, supportive environment where business thrives and building a secure savings plan so everyone can afford to retire. Applications are being accepted through Grants Ontario until November 14, 2014. The 2014 Budget committed $3 million over three years to the Remote Electrification Readiness Program. 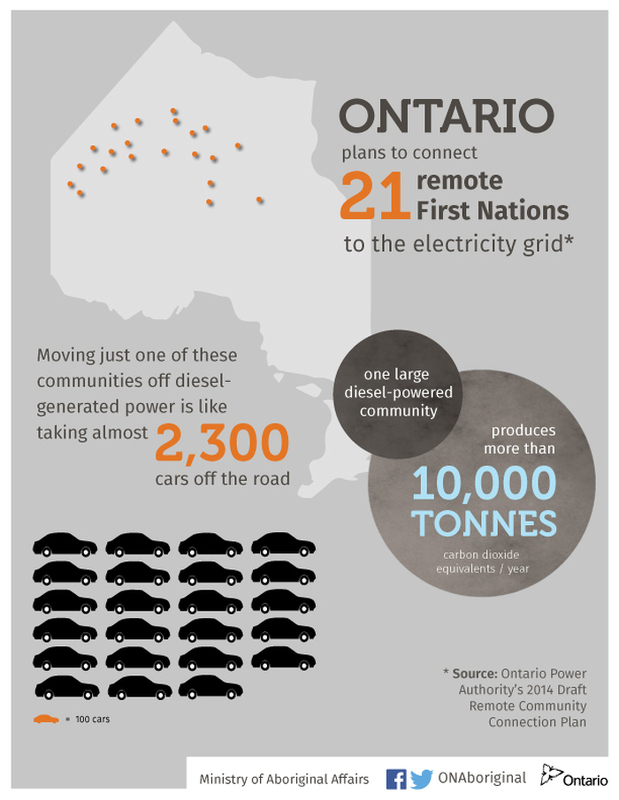 The Ontario Power Authority released an updated draft Remote Community Connection Plan and is engaging participating communities to finalize the plan in the near future. There are 25 remote First Nation communities in northwestern Ontario that currently rely on diesel power. Diesel engines emit particulate matter, nitrogen oxides, hydrocarbons and air pollutants. This can contribute to smog and adversely impact human health and the environment. A large, diesel-powered community produces more than 10,000 tonnes of carbon dioxide equivalents a year. Connecting such a community to Ontario’s transmission system is like taking almost 2,300 cars off the road. Find out how to apply for the Remote Electrification Readiness Program. Review the Ontario Power Authority’s draft Remote Community Connection Plan. Read Ontario’s updated Long-Term Energy Plan, Achieving Balance. This document was published on October 27, 2014 and is provided for archival and research purposes.